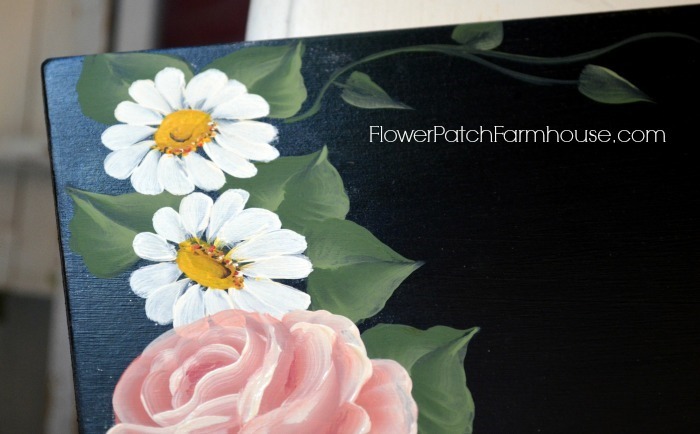 How to Paint an Easy Simple Daisy. I have a new painting tutorial for you. What is great about learning to paint all these simple designs I share is you can make and decorate so many things. It doesn’t take a lot of supplies or room, it can be done in a few minutes and people love getting hand made items. You can even make your own custom wrapping paper. I showed how it could look on plain brown paper. And if you want a bit more shimmer, try metallic paints. 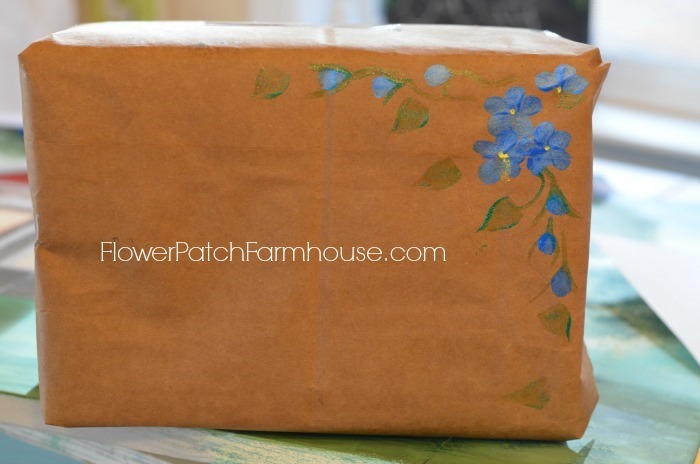 Here is a 5 minute video of how to paint these Daisies. First off I have a drawing I work from. Sometimes I don’t use one as I can just jump in and paint them but when you are starting out, a sketch is good. This came out of one of my painting books, I think a Priscilla Hauser one. Since I will be working on a dark surface I will transfer the pattern with chalk instead of using graphite paper. I flip the pattern over and run a piece of chalk on the back surface mostly behind the drawing. Then I flip it face up, position it and take a pencil or pen and trace over the drawing. I had hand drawn the circle in for the rose so I could position the daisies around it. It is a bit messy with chalk dust but that dust brushes right off. First I paint in a small Yellow Ochre oval for placement of the center of the daisy. I undercoat the petals in Vintage white with a #6 filbert brush. When I am in a hurry I dry the separate coats with a blow dryer. If a coat is still to wet with acrylic craft paints it just pulls up the prior coat. Once dry I apply the second coat to the petals in Wicker or Titanium White. You do not have to be perfect, if the undercoat shows around some edges that just gives it dimension. Now for the centers. I go over the centers once again with the School Bus Yellow color. Shadow along the bottom of the center with a yellow ochre and along the top with a Cadmium Yellow to highlight some. You can tap it in or stroke it for whichever effect you wish. Use a small flat brush to stroke in a small C stroke with Burnt Umber for a dimple. Seems I did not get a still shot of putting in that part but it is in the videos.